I spent 13 years of my life living in a wooden "shack" above a restaurant called Rice n Beans in Boqueron Puerto Rico from 1993 to 2007. During that time I scuba dived in the La Parguera and participated in Triathlons which in the early 90's was a predominant male orientated event! In 1993 I found myself swimming to the shore of Puerto Rico at 2am in the morning as the Captain of the boat I was on was drunk and wanted more than I was willing to give! The shore was Boqueron to which I was to fall in love with! The Island would cast a magical spell and I would end up an adopted Boricua and even begin to do Triathlons and Ultra distance events! "Due to the applicants hearing loss we feel she would be a burdan on public funds"
I was devastated! I started running on Boqueron Playa and helped a local dive shop become a PADI shop in return for food and lodgings! The scuba diving was good in La Parguera and I was fortunate enough to dive at Mona Island and camp there to be with Boqueron Dive Shop! I did my first triathlon in Vega Baja and was smitten with the tri bug! I met the right people and enjoyed the challenge that the sport gave! From 1993 to 2006 I represented Puerto Rico with 100% of my soul! I loved Boqueron and met many special people who opened up their hearts and homes to help me achieve what I am today! I swam alot at the playa of Boqeron every day, I would do a few miles I met some really cool people on the beach. Bob and Nancy Schluter were amazing swimmers, Nancy would do a work out including push ups and back stroke, Bob would swim. Bob tried to help me with my swimming and the best thing I remember is him asking me to go as fast as I can between two bouys, I swam hard he asked me how I felt I said good, his reply was I did not go fast enough! LOL ! I was like a pressure cooker before I hit that all out exhaustion I would hold back! Bob and Nancy were and I say still are good friends I used to clean their beautiful home once a week and house sit when they were on Vacation. I was also adopted by Sid and Vi Ewers Sid was my abuelo (grandfather) in Puerto Rico and he made sure I had food and was able to use his phone to call my parents in England. I used to swim every day on Boqueron Playa, and I lived in a little wooden 3 room shack, it was on the top of a restaurant called Rice and Beans, the wood was full of termites and the roof had bats living in it, I also had occasional mice but it was my home and I loved that little place. No kitchen or hot water no computer or cell phone, but I had a nice bike and a few good friends, and I just began doing triathlons and scuba diving and before I knew it I had been in Puerto Rico for 13 years!!! What is an Ultra Triathlon? Since 1996 I have been enjoying the challenge and pain of Ultra Triathlons. ..is not an easy feat yet thousands of athletes a year do these events. I have been blessed with doing Vineman 94, New Zealand 95, Great Floridian 95 & Lanzarote 2005. Great experiences, but it was during New Zealand when I met some athletes from Wales who planted the idea I should go and do a Triple Iron race in France, wow a Triple Iron distance...never one to back down from a challenge I went back to Puerto Rico and thought why not! Here I am in the 1995 New Zealand Ironman! In 1996 and 1997 I travelled to Fontanil near Grenoble in France and finally in 97 I became the 9th woman in 10 years ever to finish a Triple Iron distance race and finished in 3rd place! 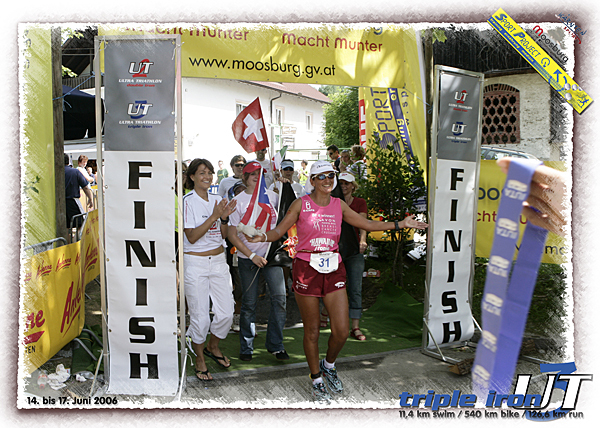 Here I am in 2006 finishing the Triple Iron World Championships in Austria. Ouch I hear you exclaim, and it is non stop! But I finished in 51 hours and 41 minutes, I had ran 1 mile 78 times, I had swam 220 laps of an outdoor swimming pool and divided it up into 20 laps and rest, then cycled so many circuits I lost count! What I learn't was the comeradie of the other athletes and how important a support crew is. Everyone was suffering at some point and the finish line was special! I have also competed in Austria Triple in 2006. Here is a sweet moment in 3rd position over all female at a double iron distance in Austria. Going through the night and day I found challenging but the more you do the better you focus! It was in France that I met Eric Seedhouse who suggested I go to Hawaii and compete in the World Ultraman Championships so in 1998 I found myself staring out to the ocean at 6am in the morning getting ready to swim 6.2miles!! What makes Ultraman different is that it is a 3 day stage race each day having a 12 hour cut off. I am currently the only woman to participate in the World Ultraman Championships 15 consecutive years! WIth 12 official finishes, and 5 age group wins. It is always held over Thanksgiving weekend and the local people really make this event special. There are not as many athletes who participate in Ultra Triathlons, but then in the beginning there was not many athletes who did Ironman racing, I remember in 1994 in California the Vineman held the Ironman distance with the half on the same day! Now that would not be possible as Ironman distance events seem to sell out a whole year in advance! There seems to be no recession in the Triathlon industry! Yet the doubles, Triples and Ultramans have their own loyal followers and every year new faces enter the family of Ultra triathlons... the sport is growing! The first double triathlon here in the states was held in Huntsville Alabama 1984. Yet it is by far more popular in Europe and it does have its own governing body just like ITU, their site is www.ituasport.com I am very fortunate to have been able to challenge myself on this circuit and meet some amazing athletes! Here in the States the only double and triple is the Virginia event in October, which usually sells out and is held in Lake Anna State Park, when I first did that event in 2003 it was ran by Don Mann, know it is in the capable hands of Steve Kirby who has a great passion for the event and the athletes and is hoping to grow the event here in the USA. There is also a Quintuple 5X the iron distance and a Deca which is 10X the iron distance. One day I may attempt the Deca when they change the one mile format loop!! • 262 miles running...1 mile circuits! Every Year when this event the Deca is held in Monterrey Mexico the event organiser now changes the format to every other year 10 individual iron-man distances over 10 days verse the continuous non stop format! Each has its own challenges due to sleep deprivation to recovering from a marathon every morning! A few years back it was held on the Hawaiian Island of Oahu but soon went back to Mexico the following year! Here is a link to my 3 page article published in the 2010 November Endurence news letter. By the time you read this Virginia double will have celebrated its 25th Anniversary of Double iron racing, and last year in 2009 Ultraman Hawaii celebrated its 25thAnniversary of 320 miles around the Big Island of Hawaii. Ultra Triathlons are out there and every year more and more triathletes are discovering the unique challenges which face the competitor in these events! I did my first tri in 1993 in Puerto Rico became hooked did an IM in 2004/5 and then went straight into the fire and did a Triple Iron distance race in France. I had not a clue what I was getting my self into my mental strength would guide me as there was nothing much in a way of training for them back then!! I ended up with a few cracked ribs from my bike skidding on ice in the middle of the 336 mile bike ride, not before discovering after 7.2 miles swimming my crew had left my helmet 20 miles from the swim finish!! Where I ended up cycling through Grenoble in a French Telecom hard hat on French TV to get to the cycling circuit where my helmet was! Roll on 1997; I went back to France to finish what I started with a plan… I swam 222 laps of the outdoor pool, every 20 laps I would stop and hydrate and take in a few calories, soon 7.2miles was over weird just as you think you cannot swim another stroke it is time for 336 miles of the bike. This was split up in 11 mile loops of open to traffic road, I remember a slight uphill which seemed like a bump but after 300 plus miles seemed like a mountain peak! When I finished that ride I was in the hurt box, I could not bend my knees and was just tired!! Already other athletes were running. I took a well needed hour sleep and then went on to do 4 half marathons in mile loop format, at mile 60 I questioned my sanity I had never run that far in my life! then last half marathon was a sure suffer-fest as I had hurt my right foot two weeks prior in the NICE Worlds long distance Tri and now I thought it would not be possible to finish the last 5 miles, the medical doctor said maybe one more mile but 5 miles later I became the 28th and last athlete to finish the triple iron race out of 48 starters, and 3rd female and good enough for 9th woman ever in 10 years to finish the Defi De Mondial in 51hours and 41 minutes! I was not the strongest woman or the best athlete but what I had on my side was my mental state, it was 1 mile 78 times, I tried to split up the distances into conceivable miles. It is now 2010 and I have 12 Ultraman Hawaii competitions, 2 triple iron races and over 12 doubles to my resume, all have there unique challenges all must be respected. This is a 4.8mile swim, 224mile bike and 52.4mile run. The clock never stops and it is a sure thing you will be riding in the night-time. The cutoff for a double in 32 hours, now some doubles have extended that time to 36 hours. Be prepared to swim 7.2 miles, cycle 336mile and run 78 miles, as for the double the clock never stops. Old cutoff time was 52 hours new cutoff time is 60 hours. 3 days of racing circumnavigating the Big Island of Hawaii to complete 320 miles with each day having a 12 hour cut off: Day 1; 6.2 mile swim & 90 mile bike to volcano, Day 2; 171.4 mile bike, day 3; 52.4 mile run. All the ultras require the athlete to have a crew which is VERY important and can consist of 1 person or several people who can aid with nutrition positive reinforcement and camaraderie. It is not easy for crew as they watch their athlete go through a range of emotions and remembering not to take it personal as their athlete becomes tired and grouchy! In a Double and Triple iron format the racer actually passes the finish line multiple times as they run and bike in loops and swim in laps, It is almost like a little village of tents housing the crews everyone is friendly and helpful and the athletes see each other many times! The crews cannot follow the athlete with a vehicle on the course and may run with the athlete during the run. In Ultraman Hawaii the crew bunny hops in a vehicle to support the athlete, you may not see the faster athletes until the end of each day! The main job is to keep the athlete moving forward with no excuses to stop. Swim: this is usually in a 25 meter or a 50 meter pool, which can make for some serious lap swimming! Every athlete has an appointed lap counter. In Ecuador the swim was in a cold lake at altitude and the athlete would swim in circles around a 50 meter buoy line. I remember asking my crew for hot water to pour down my wetsuit I was so cold! That was an awful swim, with a green muddy slimy bottom! In Quebec the swim was a pleasant swim down the St. Lawrence River with the Chateau Frontenac in the distance. Each athlete has their own kayaker, and the swim is usually started when the current is in the swimmers favor, so the organizers add an extra half mile or so to compensate! UM Hawaii Swim is a 6.2 mile Ocean Swim, every athlete has an appointed kayaker the BIG difference here is OPEN WATER!! I wear my Aquaman Wetsuit with full sleeves, more to protect me from jelly fish! Although I do feel like a seal waiting for a shark to toss me, but in the 12 swims I have done in Hawaii everyone has been different, as visibility tidal movement high low tides etc never seen a shark but had dolphins jump next to me seen Whales and Manta Rays and as you pass into the final mile colorful reef fish. I ask my kayaker to stop me every 30 minutes so I can refuel, with Heed and Electrolytes. Once out of the water the athlete makes way to the transition area on the way to the bike I try to eat and get calories into my system, also very important to keep well hydrated it is a long day and you cannot afford not to fuel adequately! Mental games can greatly aid the bike ride, for Double/triple distances expect to do anywhere from 100 to 200 loops on the bike, Make sure you have good lights as I guarantee you will be using them. Cycling 224 or 366 miles will be a life altering experience!! I have done these rides with little training and truly suffered and then been smart and did double century challenges in So Cal to prepare for the suffering! At night some of these races are held in secluded area and wildlife occasionally will stumble out onto the bike course, Deer in Virginia and Owls in Ecuador! In Ultraman the bike is around the Island and several climate changes can take place on any given section! Expect rain and wet in Hilo, Windy in the Kohalas, Hot and challenging climbs towards the Black Sand beaches and cold towards the Volcano, expect the unexpected. This is a tough ride and all road rules must be observed! The good thing is after 90 miles on the bike you can rest at the volcano and resume the 171.4 mile bike on Day 2 so massage good food and hydrate all important things. Okay this is the big one! Unless you are an Olympic cyclist and did the bike course in record time if you cannot run you will have a hard time processing 78 miles. No matter how you work out the format so many laps or 1 mile 78 times it is still 3 marathons back to back. I learnt the hard way not to go out fast in the first marathon, keep good nutrition and really helped to have a crew member run along side me. The real race in long distance running usually begins around mile 40 or mile 60! This is where either your legs give in or your mental edge cracks! It is just one foot in front of the other and I love to stretch every few miles of so. In France when I placed on the podium the two females who DNF did so 10 miles from the finish on the run!! Thank fully I discovered Hammer Nutrition and for the Ultraman Hawaii I will have several bottles of Perpetuem made up, as I have a crew that sees me often on the road I have the luxury of fresh cold bottles every hour. I am religious with race caps supremes, endurolytes and anti fatigue caps. I also like to eat hammer bars. It is VERY important to fuel wisely and not think if a little is good then more must be better and despite the heat of the 52.4mile run I have never taken salt tablets as they only add to my fatigue and can cause my body to hold water. As Ultraman Hawaii is more akin to a 3 day stage race I am able to get solid food into my system on the evening, I try to keep to plain what I know works best for my system, pasta and cheese the plainer the better I have learnt the hard was that eating spicy foods and too much food will not make for a pleasant day on Day 3 of the run! During the doubles and Triples life becomes a little more complicated as you are on the move for the entire time, If it is hot I keep to a liquid diet and on the evening and during the night I eat mashed potatoes cheese sandwiches and bananas. I have been known to make crepes out of protein powder and fill with gel and consume every hour. The most important thing to remember is calorie intake as an endurance athlete you will always be in deficit for my weight I keep to 250 calories an hour. I also do not sacrifice sleep I would never dream of waking up 3 hours prior to an ultra event and rely on a good sensible meal the evening before and the morning off take a gel 5 to 10 minutes before the start of the swim; this is enough to kick off the liver glycogen and get you moving in the water for the first 30 minutes or so. To me it is really important to have a BIG base on which to build on, so you have less chance of being injured, then once you decide which race you are going to do you can mentally prepare and peak for the event. No.. I do not swim 6 miles in training! neither do I cycle 300 or 200 miles a few times a week. I firmly believe that good base training and consistency is the key to Ultra Training. I target 50 mile runs and sign up for 200 mile bike events when I need mileage. I love running marathons for training and just joined a Masters Swim group in Covina as I realize how important it is to be as efficient as possible in the water. For some athletes they need to have guidance and some sort of structured coaching for others such as myself I read a lot, ask many questions and know what I have to do to get the job done. I was rarely injured during the years I raced Doubles and Triples and accredit this to the huge base on which I could build on. I also found really good information in two of my favourite books: Lore of Running by Noakes and Long Distance cycling by Burke and Pavelka. After teaming up with Hammer Nutrition I found a wealth of knowledge from Steve Born also. Hours of training you have to remember to look after your body, remember when it is tired and not to push through fatigue but to rest and build up, recovery drinks are very important The Recoverite by Hammer is probably one of the best on the market. I am a HUGE fan of my Polar Heart Rate RS800CX as I can target hard efforts and by monitoring my heart rate can tell if I am heading towards over training, earlier this year I had a heart scare the main reason was not enough quality sleep and I saw the pattern develop and caught it before I put myself into the dark zone due to my Polar monitor training. Good sun care is important as getting sunburn during a long ultra run is no fun. I use Ocean Potion dab on stick for nose ears etc and wear a good white hat and sunglasses are a must again I prefer Rudy Project! There is so much involved in Ultras I could write a book!! Ultra Triathlons are here to stay! As a veteran of many you have to learn to be able to keep going through uncomfortable moments I am not going to tell you they are fun and you will be laughing and high fiving all around the course as a double and triple can be mental tough and sitting on a bike seat can be somewhat a pain if you forget to use Hammer Balm or similar product. My most joyous moments are finishing the swim and bike cutoffs and the biggest moment crossing the finish line! Everyone is a winner who just signs up and attempts to challenge themselves! It is very important to remember no matter how prepared and well trained we are things may always go wrong on race day or leading up to the race. Some of my biggest things were a kidney stone in Hawaii during the run in 1999; despite severe pain I managed to finish the run and ended up passing a stone in hospital later that night! Then I had an abscessed tooth in Quebec double the night before the swim and in Canada getting anything stronger that ibuprofen if tough and I was on a lot of IB to get me through that event which I survived and ended up getting Gold!! Then the really bad moments like going to sleep on my bike at mile 200 and breaking a collar bone or Altitude sickness after a 4.8 mile swim and 100 plus miles on the bike!! You have to be able to deal with racing in the hurt box and take comfort from the fact that everyone else is also racing in the hurt box! !